Dave Galloway is a watch repairman in the mythical city of Everton, New York. His life is one of familiar routine—he goes through the same motions every day at work and at home. But this comfortable existence is unexpectedly thrown into chaos when Dave’s 16-year-old son Ben runs away from home. We learn that Ben has left with 15-year-old Lillian Hawkins and they plan to get married in Illinois, which recognizes marriage between young teenagers. While Dave reflects that Ben has abandoned him, we learn that Dave’s wife had abandoned him as well, when Ben was just one year old. The story takes an uglier turn when police break the news that Ben has shot and killed someone and taken his car. While the police chase Ben, the news media interview Dave and he agrees to pose for pictures and answer all their prying questions. Soon, Ben is captured by the police after a shootout and is taken to Indianapolis. Dave travels there only to suffer more embarrassment when Ben refuses to see him and the police tell him they are moving Ben back to New York and he traveled to Indiana for nothing. Dave hires an expensive lawyer for Ben, who since his capture has expressed no remorse for his crime, seems proud of what he has done, and acts as if he wants to sit in the electric chair. A psychiatrist evaluates Ben and determines he is sane and can stand trial. While these events transpire, Dave examines his own mind to try to discover some sense to Ben’s crime, which seems completely pointless and unnecessary. Much of the novel has Dave retracing the signal nerve points of his own life in an attempt to extract meaning from Ben’s actions—his own father’s one night of cheating on his mother; his own decision to marry the cheapest woman in town who had already slept with all his friends; and now Ben’s murder of a stranger for his car and a few dollars. All three of these events were solitary acts of “rebellion” by three men of the same genetic line who otherwise spent all their lives getting ”whipped” in life. Unsatisfied, they needed to temporarily revolt against their own nature. The question is left at the end whether this cycle would turn in the other direction in the future. 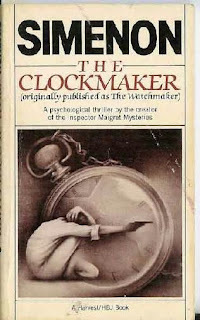 The Clockmaker, also published in English as The Watchmaker (first published as L’horloger d’Everton in French in 1954), is a psychological thriller written without Simenon’s most famous character, Inspector Maigret. Only 124 pages, it can be read in a few sittings. Simenon forces the reader to consider if Ben’s actions were already somehow foreordained; the culpability, if any, of his father; and if the similar psychology of Dave, his father, and his son, will change or remain the same in future generations. The New York Review of Books has reissued a number of Simenon’s novels in recent years and this would make a fine addition.